Luton Airport’s digital employee…it’s like something from Total Recall. On a recent trip from London’s Luton Airport, I encountered this helpful chap, who was on-hand to provide some guidance on how best to navigate one’s way through customs. I’m sure this is quite a common technological advance at airports across the world, but it’s the first time I’ve seen such tech used first-hand. It’s like something from Total Recall. 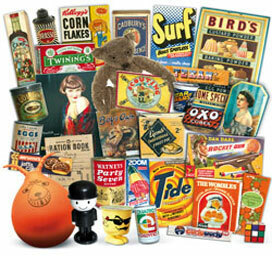 The Museum of Brands, Packaging and Advertising…a quality find! Sidling along a residential mews in Notting Hill, I was convinced my phone’s GPS was playing games with me – surely there was no museum here? But my suspicion turned to pleasant surprise as I glimpsed a glass facade at the end of the road that was most certainly a building for public perusal. The Museum of Brands, Packaging and Advertising had been on my radar for some months after reading about it in my ‘1000 things to do in London’ Time Out guide. And finally I was here…not really knowing what to expect. The museum more than lived up to its name. In fact, the museum definitely did what it said on the tin (thanks, Ron Seal).